Found a home in a bedroom in Somerville, Ma. 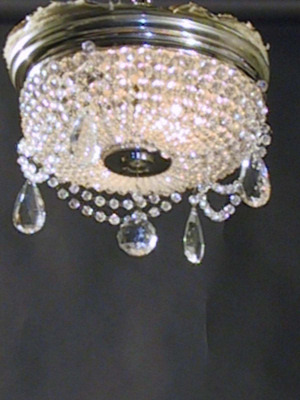 Circa 1930, this Flush Crystal Light with Drapery has a nickel plated banding and measures 11" length x 7 1/2" diameter. The insulation on the top of the fixture disappears when the light is installed. This is another great flush fixture for a 7.5 or 8 foot ceiling.